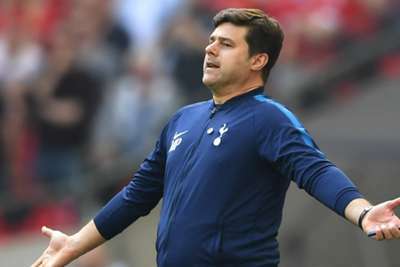 Spurs' hopes of a first trophy since 2008 were ended for another year on Saturday, as Manchester United came from behind to beat them 2-1 in the FA Cup semi-final at Wembley. But Pochettino, who took over as manager four years ago, thinks it will take the same time again to cement Spurs' place as a consistent challenger for honours and even suggested it could fall to another manager to continue the work. "No, no regrets [about the game]," he told a news conference. "I think we competed, we dominated the first half completely and 1-1 was unfair. 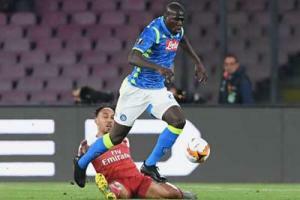 "In the second half they scored and the game was more competitive. It was even. "Of course, when you compete with these kind of teams like Manchester United, it's always 50-50 and today the victory was for them. "We are in a process where we get to the FA Cup semi-finals, we get to the Champions League, we are fighting for the top four. It is tough because we are close, we are close, nearly. "Over the last four years, we are building a very good team, trying to create the winning mentality but at the moment it is not enough. Tottenham have to keep going in this direction because it will be perfect. "To create that winning mentality is another four years. I think Tottenham [with] more time, with me or with another, but I think it is important to keep developing that philosophy that is important for the club." Pochettino believes there should be more "realistic" critiques of Spurs' achievements in recent years, insisting they cannot always expect to compete with the likes of United and Premier League champions Manchester City. "The most difficult thing in football is to be realistic because no one is realistic," he said. "But, at some point, you need to be realistic and our fans need to be realistic. "Of course we can win but most of the time we are going to struggle to compete. Tottenham is a completely different club to others. "Four years ago, when we arrived, there was the challenge to be competitive and to reduce the distance to the top four. In the last four years we were there and competitive, but to win a trophy is not easy. "For me, it is about keeping going. I am disappointed and after the game very frustrated but quickly I move on, thinking how to finish the season in the best way. "We have four games to make sure we can play the Champions League and it will be a successful season if we finish in the top four."